All too many of us have had the very unpleasant experience of driving along, minding our own business, when all of the sudden and errant piece of debris, perhaps a rock or something else, smacks right into the windshield. You breathe a sigh of relief because all it did was put a little dent in your windshield. But a few days later, your little dent had transformed into a sprawling crack that you fear might spread to the other car windows. It won’t, of course, but it makes you feel that way. Not surprisingly, windshield replacement in Long Island is one of the top insurance claims. 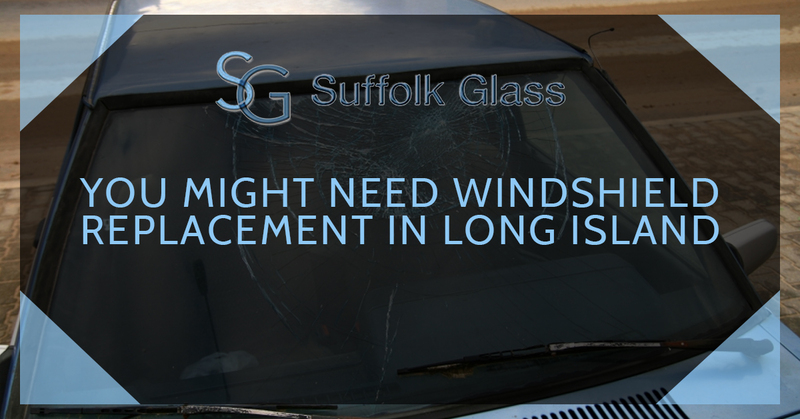 All it takes is one little pebble and a rock impact of the tip of a pencil and you will be calling Suffolk Glass for windshield replacement. Small pieces of gravel may leave very small pits on your windshield. These might be so small that they are hardly noticeable unless you are up close to them. These small pits will collect moisture that will push the glass in all directions and cause spider-webbing. This is why you need to check your windshield for little pits and have them repaired right away. There are other reasons your windshield cracks and otherwise suffers damage. This is another obvious reason windshields suffer damage. A deluge of large hail in the form of stones can cause a lot of damage to your car’s windshield, and the rest of your car as well. Multiple strikes of these flying ice chunks can pepper your vehicle and leave countless chips and cracks. In many cases, repair is useless as the windshield will need to be replaced. It is a good thing that hail damage is fairly infrequent. Large variations in temperatures expand and contract your windshield on a continual basis, which often produces small cracks that extend the length of your windshield. If it is 30 degrees outside, you are likely driving with your heat blasting. If the temperature inside your car is 75 degrees, the inside layer of your windshield in expanding while the outside layer, which is in the cold, is contracting. This causes distortion and any small defects that are in your windshield will begin to crack. Add moisture to the mix and this process speeds up exponentially. You may have noticed that the majority of cracks on a windshield start near the edges. This is because due to the manufacturing process, weak spots occur about three inches from the edge. Also, the large middle area of your windshield is able to flex and can absorb shock, but the edge must endure the heaviest loads. If a windshield isn’t properly installed, it could come loose and vibrate, which will certainly cause cracks. Lie with changing temperatures, sunlight can cause problems for your windshield. The heat of the sun of metal and other materials near the windshield can cause the edge of the glass to expand faster than the middle of the glass, which will cause cracks. It helps if you keep your car in a garage or park in the shade as often as possible. Although rare, there are limited cases in which the glass installed in your vehicle may have a defect. The bad news is that you may have a windshield that suffered damaged. Even worse news is that you need to take the time to have the problem resolved. The good news is that you can have one of our trained technicians fix or replace your windshield quickly and efficiently. If you aren’t sure if your windshield is damaged enough to warrant repair, the truth of the matter is that a damaged windshield almost always needs to be fixed or replaced. But to be sure, give us a call.